An extraordinary tree frog thought to have died out more than a century ago has been rediscovered in India. The discovery was made by renowned Indian biologist Sathyabhama Das Biju and a team of scientists, in the jungles of north-eastern India. It is hoped the frogs might now be found across a wide area, from China to Thailand. Studies of the frog have also led scientists to reclassify it as an entirely new genus. The golf ball-sized frog lives in tree holes up to 6m (19ft) above ground, which may have helped it stay undiscovered. Although other scientists have suggested it may have gone unnoticed simply because there are so few scientists working in the remote region. The height at which they live is not their only quirk, with females laying their fertilised eggs in tree holes filled with water, only to return after the tadpoles hatch, to feed them with unfertilised eggs. Unlike most frogs, adults also eat vegetation rather than insects and larvae. 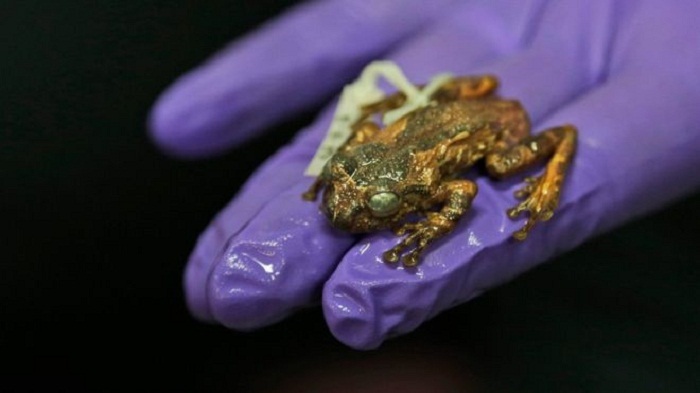 The newly uncovered frogs were first found by accident in 2007, during a search for other animals. Biju, of the University of Delhi, is known as The Frog Man in India, for discovering 89 of the country's 350 or so frog species. "We heard a full musical orchestra coming from the tree tops. It was magical. Of course we had to investigate," Biju said. Using DNA analysis, Biju and his colleagues have now identified the frogs as part of a new genus, meaning it has a new name. It has changed from Polypedates jerdonii - named after Thomas Jerdon, the British zoologist that collected the previously only known specimens in 1870 - to Frankixalus jerdonii, after herpetologist Franky Bossuyt - Biju's adviser when he studied at Vrije Universiteit in Brussels, Belgium. Although the frogs have since been found in significant numbers, they are far from safe, Biju warned, with tropical forests being cut down at alarming rates to make way for agriculture and human settlements.